Correctly applied chiropractic therapy is a very powerful technique for resolving sore backs, rumps and necks. Most back problems are missed due to the assumption that the horse simply is lacking muscle. Lack of muscle is one of the major signs of a pre-existing back problem. If the horse’s ribs are well covered but his top-line is poor, then this suggests a problem that needs chiropractic care. Issues such as roached/sway back, uneven rump height, ewe neck and poor performance are all indicators of a spinal problem. Imagine the image of a young foal when you look at a horses back. Foals are well rounded across the shoulders, loins, rump and neck. Anything less than this ‘foal’ shape is often an indicator of muscle loss that is associated with injury or poor saddle fit. Saddle fit can be quite challenging. Often you may need to get a couple of opinions before you can be happy the saddle definitely fits and is not causing your horse pain. Poor saddle fit often causes loss of the shoulder muscles, a more prominent wither, and a sway back. When shopping for a new saddle, it is wise to get an ASFA Level 2 saddle fitter to assess which saddle brands will suit your horse. Once the appropriate brands have been determined you then need to work out which brands suit your pelvic and hip shape. 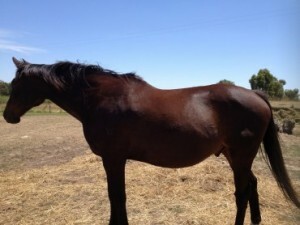 Fat horses can be deceptive as they could be covering loss of muscle with excess fat. Usually these horses will still have an alteration of the ‘foal’ shape when looked at closely. Horses should have their back checked and treated by a qualified chiropractor every 6 months to maintain ideal athletic ability, even if they appear to be pain free.